Unique manuscripts, books, music, art and other highly regarded materials support not only student and faculty research but are also available to interested community members and visiting scholars. These rare collections provide Blugolds with hands-on experience in research and curation, cultural appreciation, access to one-of-a-kind resources and a glimpse into the historical past of our region and country. There are many ways to support special collections and projects at UW-Eau Claire; from planned gifts to endowments, gifts-in-kind, IRA rollovers, securities and stocks, annual pledges and more. Your generosity supports excellence in UW-Eau Claire teaching and research now, and for generations to come. UW-Eau Claire is home to numerous people, projects and programs that inspire excellence. Crowdfunding allows Blugold students, faculty, and staff to spread the word about their projects and raise the necessary funds to bring them to life. Learn more about how crowdfunding provides you, our generous donors, an opportunity to direct your gift to a department or project that is meaningful for you. Your impact turns these dreams into reality. We can help you leave a lasting legacy that reflects your personality and your passion. 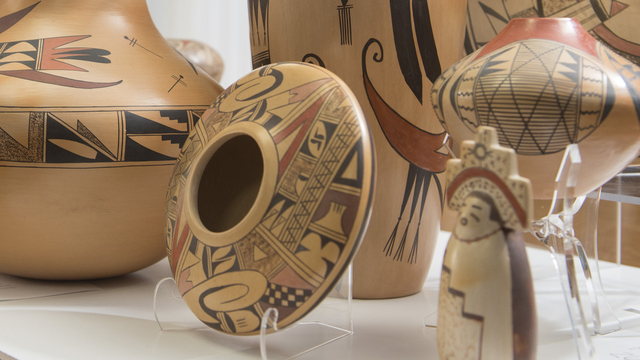 Two former art teachers have gifted their extensive Southwestern pottery collection to the UW-Eau Claire Foundation. The collection will be displayed on campus and used as an educational resource. The Wisconsin Historical Society is honoring three Blugolds for their work in documenting the state’s history.